Profile: Tim North is President of North Manufacturing, makers of Broughton Barrels. 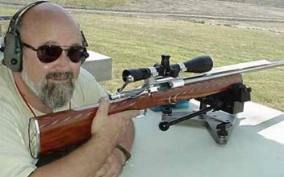 He is also a heck of a good long-range shooter, having captured the 2003 1000yd BR championship with a barrel of his own making. Tim's company has recently expanded their line of 5C® (canted land) barrels in .223, 6mm, 6.5mm, and .308 calibers. These have proved super-accurate, winning matches right out of the box. Broughton's 5C® designs also run faster and foul less than conventional barrels. "We first used the canted land pattern on .30-caliber and 6.5mm barrels, and the results were extremely positive. Accuracy was outstanding and the barrels were winning matches. It may seem hard to accept, but profiling one side of the lands really does improve many aspects of the barrel's performance. First of all, we are seeing less fouling. Second, comparing barrels of the same length and same number of grooves, the 5C barrels are delivering higher velocities--as much as an extra 100 fps with the longer barrels. The Broughton 5C® land profile is similar in concept to the 5R rifling pioneered by Boots Obermeyer. His barrels, like Krieger's, are made with the cut-rifling method. Here at Broughton we pull button using a guide insuring consistent twist rate in a bore free of tooling marks. We feel this produces uniformly profiled lands and the best internal bore finish. After contouring and stress relief in our oven for the third time, we finish crafting the bore by lapping a taper from beach to muzzle in every barrel. This translates into easier cleaning with less fouling. The "Ratchet Rifling" offered by Shilen on some of its barrels is really quite different than what we do. We angle more of the surface of the land, whereas the Shilen "ratchet" is more of a bevel on one edge. Additionally, Shilen currently offers the "ratchet" profile only in a 1:14 twist for the .243 caliber. That will really only work with the very short 60-68gr benchrest bullets. For 6mm barrels, we offer 5C® rifling in 8-twist currently and will be adding 7-twist and 14-twist rates in the near future. Our first 5C® 6mm barrels are scheduled to be delivered in late September. We are all anxious to see if the 5C® land design works as well in the smaller caliber as it does for the .264 (6.5mm) and .308 bore sizes. We'll be shipping one of the very first 8-twist 6mm 5C® barrels to 6mmBR.com in September, and they'll be doing some field testing, comparing its performance to a conventionally-rifled 1:8 barrel."